Two Japanese restaurants sit a mile apart, and you can’t go wrong with either. Our happy hour this week is a twofer, a pair of Japanese restaurants that sit a mile apart, offering duck meat balls and pig ears. Maybe you visit one. Or maybe you hit both. You can’t go wrong with either (unless you were expecting nachos and sliders). Kamonegi is the new soba-and-tempura spot in Fremont, the current must-nab-a-seat place. The unassuming 32-seat restaurant has a soft, calming Eastern aesthetic, a stark contrast to the rush-hour-honking mayhem on the other side of its windows. It’s not known for its bar. Few even know happy hour is served. But come before the dinner rush and you’ll find beautiful snacks composed by chef Mutsuko Soma. 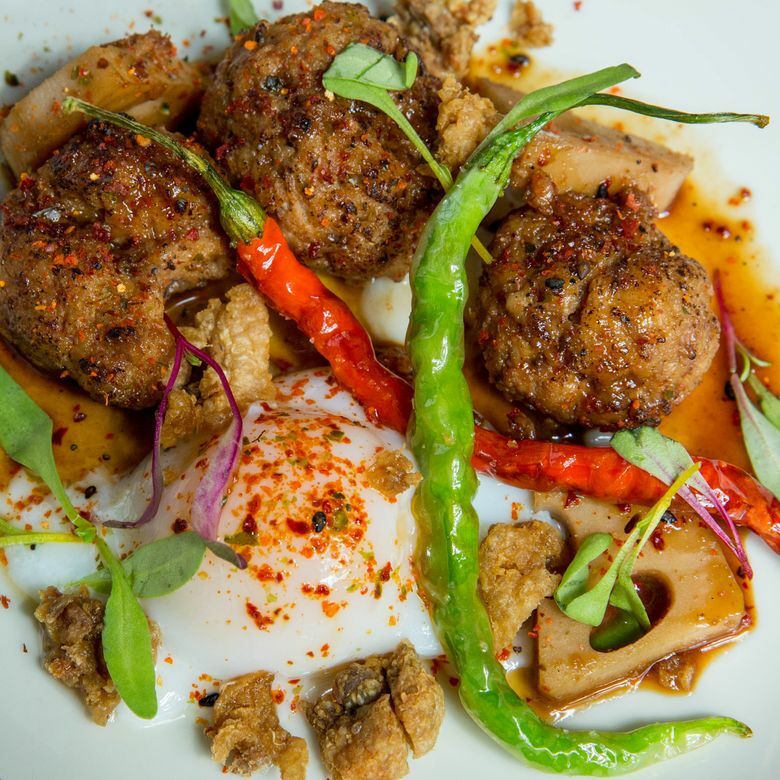 A plate of duck meatballs ($8) comes with crispy-fried duck skin, lotus roots and a sous vide egg to give it a creamy, rich oomph. You’ll want to mop up the soy-reduction sauce. 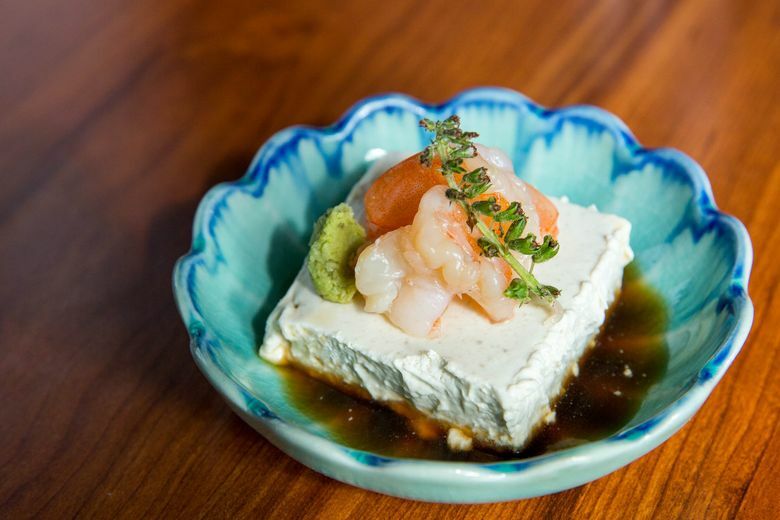 Foie gras ($9) is rejiggered to look like a tofu square and doubles as a canvas for the artfully plated sake-poached shrimp and a dollop of wasabi, layers of sweet, creamy and spicy, served with dashi sauce. It’s magnificent. Her happy-hour noshes are exacting and refined. Kamonegi is not so much a happy-hour hangout, more like a teaser before the kitchen goes full-throttle at 5 p.m. and starts cranking out entrees. Kokkaku, the Japanese steakhouse along the Wallingford drag, features what is arguably the most buzzworthy meat around town these days, the “Mishima Reserve Wagyu” cut. The buttery, high-grade steak is supposed to be a million times better than the Prime grade stuff. Thus it’s priced as such: 10 bucks for an ounce of the New York steak. Kokkaku’s happy hour is more nose-to-tail eating. So much that the chicken wings on the bar menu look like an add-on to placate the less-adventurous bar hoppers. But why go there if you are going to eat here? The slivers of pig ears, braised and fried to a crunchy finish, are delightfully salty and savory, the ideal beer food. It would be fine if it were served like a bowl of pretzels. Kokkaku fancies it up over a bed of frisée salad and adds a poached egg. Chicken-liver mousse is plated with a gelatinous sheet of whiskey, brown sugar and cinnamon to give the gamy flavor a sweet, boozy punch. Think of it as having a whiskey Jell-O shot with your liver mousse. It’s delicious. The pig tails, with a sticky-sweet Mirin glaze, have a pronounced oinky flavor, a poor man’s rib. They’re nice to gnaw on, though I imagine some may be wigged out by the crunchy sound of the tail, especially if you channel Wilbur from “Charlotte’s Web” and all.